Here we go, a real trail race. A half marathon on dirt with industrial strength hills, with just short bits of pavement at the beginning and end. I had not run this course before, although the first and last segments of it were familiar from previous runs in the area. 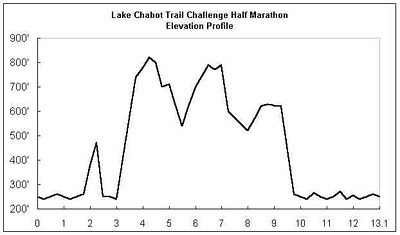 The elevation profile below leaves out some detail! We assembled at the appointed spot at 8:00 am on Sunday, the race director climbed her stepladder, and instructed us: “Hands up all 5K runners. OK, go over there, that’s your start line and you will be starting in that direction” She pointed, and movement took pace. “Now, half marathoners, I’m going to say Ready, Set, Go!” Instant consternation amongst the newbies including me. Where was our line, and which of these trails were we to head down? She paused and the volunteers shepherded us behind the low carbon footprint (invisible) start line and pointed along the trail. I shifted back a little, since I did not want to be pulled out too fast, and away we went. We followed the lakeshore on a rolling paved trail at (for me) slower than marathon pace. This was my fourth race weekend in a row. I had run a 10K PR in warm conditions just 6 days previously and was not feeling too comfortable even at this modest velocity. Ugh, feeling slow today. This could get ugly if I’m not careful. So I was careful. I ran that first mile in 8:05, conserving energy as best I could. Before we had gone two miles we turned sharp right and headed uphill to a general muttering of “OK, here we go!” and similar incantations. I said to the guy alongside “You have run this before? I hear this first hill is just a warmup”. He laughed. “The others are no steeper than this, but they do last longer”. He thought for a moment. “Much longer.” This was quite steep enough thank you. Most of us were alternating between running and walking, and those who kept running were no faster than us. As we approached the top my companion enquired “Are you warmed up now?” “Hah, yes thank you!” I was dripping already. There was cloud cover still but it was quite humid. I was glad I was carrying a handheld full of Gatorade. This was a disposable plastic bottle with a duct-tape handle. It would not be refillable with its narrow neck, but I planned to dump it at an aid station when it ran out and drink from cups thereafter. The ground underfoot was hard dry clay with corrugations where it had been eroded by the winter rains. we were weaving a little, picking a smooth line through the bumps. After a short level stretch we started downhill. On the roads I do pretty well on downhills but was plainly out of my league here. Some of these trail racers were going startlingly fast down this ridiculous gradient. Lesson one: Any (fit) fool can run uphill, but it takes experience to go down really quickly. I was far from the slowest though, and passed a few while getting passed myself. Once over the suspension bridge, we started up the big hill, getting back into the run/walk alternation. At a certain angle I can start walking without slowing down, and I got into a little routine. I would measure my pace against the person in front. If they were running, I would continue to walk until the slope eased and they started to pull away. At that point I would start running and pass them on temporarily fresh legs. Lesson two: There’s nothing wrong with walking. This hill was indeed persistent, with more than one false summit. we would reach a nearly-level section, then go round a corner and start going up again. Run/walk was not the only way, it seemed. A young woman eased past while I was walking, going just a little faster but with a very economical uphill jog. By the top of big hill she was 30 seconds in front and pulling away. She placed in her age group. Lesson 3: Experience helps on the uphills too, darn it. This does of course conflict with lesson 1, but well, learning curve. After being under tree cover for the earlier section things were more open now, but there were no grand vistas. We had climbed into the cloud layer. This was refreshingly cool but 100% humid, an odd sensation. We crested the hill and commenced down for a while. These downhills were if anything more stressful than the ups. my while body was getting a hammering, but the loudest complaints were from my heels and upper back. Try to relax more… A guy with silver hair came past, going at a good clip. The terrain started to roll for a while and we got into a pattern, I would catch him on the uphills, gap him at the top, and he would come by me again on the descents. He even commented “These uphills just kill me”. We reached the second peak and the downs became longer than the ups. He got further ahead until I lost sight of him. Oh well. For a while I was on my own, and paid close attention to the marker ribbons in order not to miss a turn. There were plenty of forks in the trail and I nearly did miss one. The cloud broke up and some fine views could be glimpsed through the trees. Footsteps behind. A young guy in grey came by, saying by way of explanation “I love these downhills!”. I was not too pleased to get passed again, but he was the last. Here was a party of mountain bikers working hard up a slope. “On your left” I warned. “Your’re doing good” one of them gasped. And I was. All ache, pains and stiffness were gone, I was running harder and enjoying it. I started to pass people. Yup, the elusive runner’s high had arrived. A photographer was waiting in a folding chair at the top of a short slope and snapped me as I approached. “You look like you’re having too much fun”. My only response was a laugh, which may have sounded a little unhinged. The long downhill back to the lakeside was not super-steep and I was able to take it at good speed. My legs were complaining but I felt detached from them, as though I was directing some avatar in a video game. The trail started to look familiar. From here (about mile 10) to the finish was ground I had run before. Running across the dam I could see some familiar backs in front of me. Grey outfit, Silver hair and some others I had not seen for over an hour. We started the paved section and came to the last aid station on a short uphill. My bottle had been dry for a couple of miles, so into the can it went and I grabbed a cup of water. Following road practice, I did all this on the run. A couple of guys were walking while drinking and looked a little startled when I zipped by. I got a surprise of my own when I swallowed that water. It was ice cold. Rolling asphalt, small hills, going fast, one mile to go, four runners visible. I think this is the last hill, and there’s less than a mile to go. Hit it! I passed all four on that hill, including silver hair and grey outfit. On the descent I heard footfalls catching up. I could guess who that would be. Silver hair came by and I stuck to him as we approached the marina. I drew level. He was working hard. I was not at all sure I wanted to beat him, but I sure didn’t want to wave him over the line either. There were some spectators applauding us as we ran neck-and-neck. he stuck like glue to the left of the track, putting himself on the inside of a sharp corner followed by a short decent. He was suddenly three yards ahead. That solved my dilemma. I covered the final 200 yards as fast as I could go and got to within yard of him, then we were in the finish chute holding our knees while gasping mutual congratulations. 2:01:49. A cheery voice cried “Hi Jim!” It was Veronica, who I had not seen since we co-paced the Oakland Marathon together. She had been first woman in 1:46. Impressive. So conservative early pacing paid off again, athough I might have over-done it on this occasion. But on this monster of a course that’s just fine. I’ll be back.